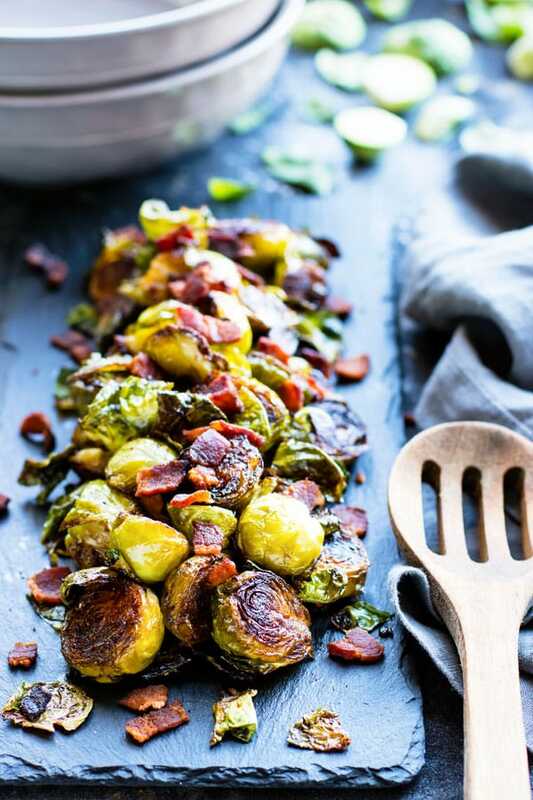 Super crispy Brussel sprouts with bacon will soon become your new favorite go-to gluten-free and Paleo side dish recipe! A few simple tricks will teach you how to make crispy Brussel sprouts every time. Crispy Brussel Sprouts at Restaurants! Brussel sprouts have always been my go-to side dish for me when eating out. For some reason, I have never been able to make the sprouts brown so nicely and get so crispy. Recently, I discovered a super quick and easy way to make perfectly crispy Brussel sprouts with bacon that does not require any deep frying or super naughty ingredients. I know… I didn’t think it could be done either, but let me let you in on a little trick! You must use some type of granulated sugar. Maple syrup and honey taste great, but they will make the sprouts soggy! Stevia powder will work great, too! You can only use JUST the right amount of oil. Too much, they get soggy, too little, they will burn. A cast iron skillet is a MUST! And a well-seasoned skillet is an even BIGGER must. Laying the sprouts FACE-DOWN in that cast iron skillet is what gives your sprouts their magical crispiness. Best Way to Cook Brussels Sprouts? I have tried everything when it comes to cooking Brussel sprouts. I have roasted, sauteed, steamed, and shredded. Made salads and scrambles. Have cooked them with onions and without. And do you know what? They all taste incredible, but I definitely have my favorite method. 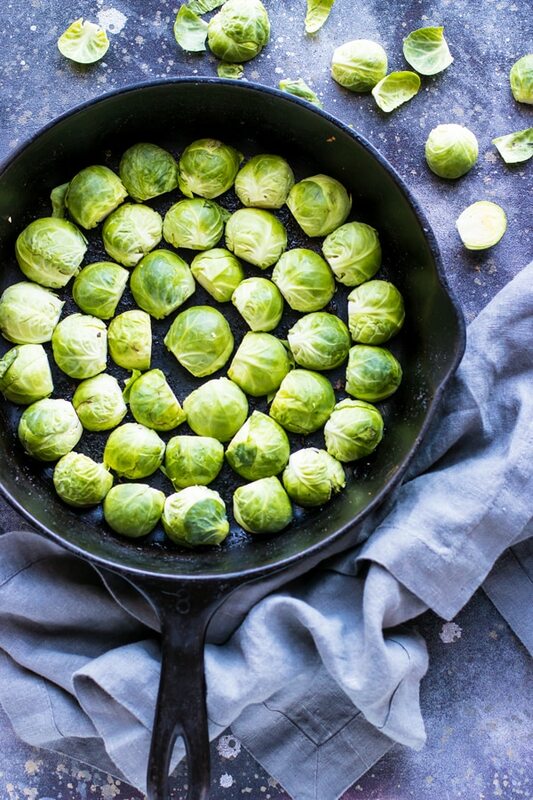 Cook the Brussel sprouts in a cast iron skillet with the cut-side-down for the first 10 minutes. Finish cooking the Brussel sprouts in a pretty warm oven (400 degrees or more) for another 10 minutes. But realistically, whatever you find is the EASIEST way is the BEST way to cook this nutritional powerhouse! 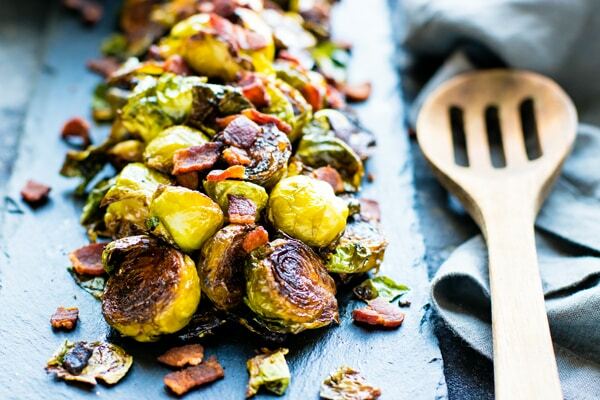 How Can You Evolve these Crispy Brussel Sprouts with Bacon? 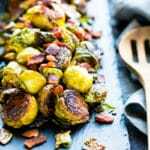 If you would like to make these Brussel sprouts Paleo, make sure to find a sugar-free bacon that is uncured. You can also always try using a turkey bacon or tofu bacon to make it vegan-friendly. Regular granulated sugar will swap out easily for the coconut sugar. In a large cast iron skillet over medium heat cook bacon pieces for 8-10 minutes. Add garlic to reserved bacon grease and saute for 1 minute over medium-low heat. Next, place Brussel sprouts cut-side down into the pan, paying careful attention not to overlap the sprouts. Saute Brussel sprouts for 8-10 minutes, or until the flat sides become crispy. Sprinkle coconut sugar, salt, and pepper into skillet and toss to combine. Cook Brussel sprouts in preheated oven for 7-10 minutes, or until done to your liking. 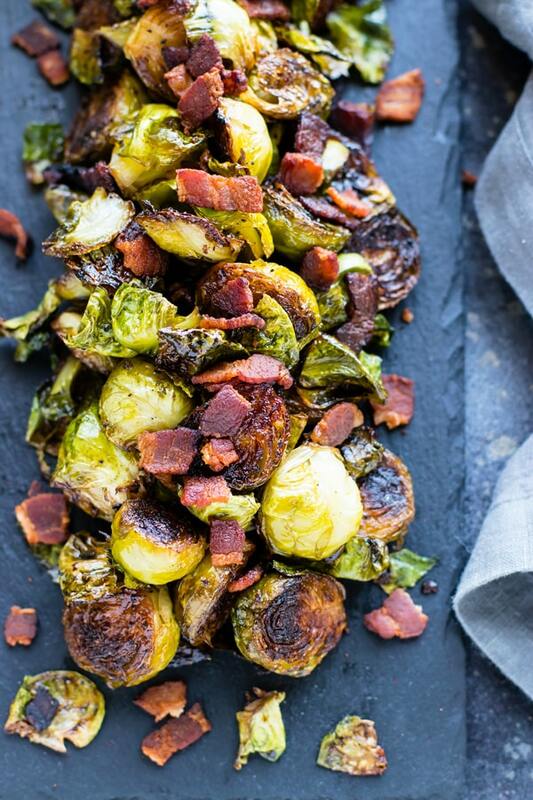 Serve sprouts with bacon pieces and enjoy! See this recipe in Meal Plan #6. *Make sure you use an uncured, no sugar added bacon to make this recipe Paleo compliant. **If low-carb or keto, substitute stevia powder for the coconut sugar to bring the carb count down to 10 grams carbohydrates / 4 grams fiber per serving. *If Weight Watchers: 6 points/serving with coconut sugar or 5 points/serving with stevia powder. 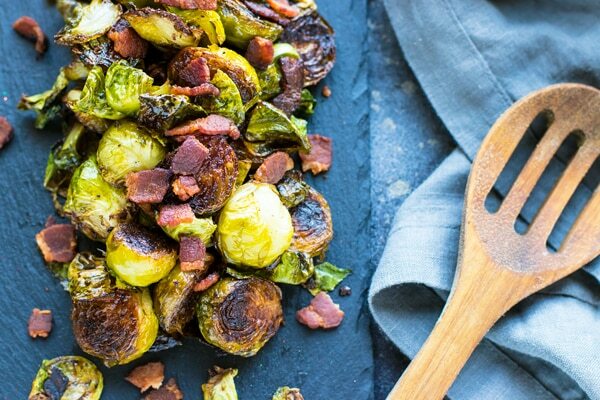 Want more recipes like these Crispy Brussel Sprouts with Bacon? I love brussels sprouts! Great presentation and these look so delicious! This was WONDERFUL!! One question – when you first cook the Brussels sprouts flat-side down, is it over medium-high heat or in the oven? Thanks! Hi McRae! I am so glad you enjoyed them. When you first cook the brussels sprouts it is in the cast iron skillet over medium-high heat and then you transfer them to the oven. Thanks for your question!